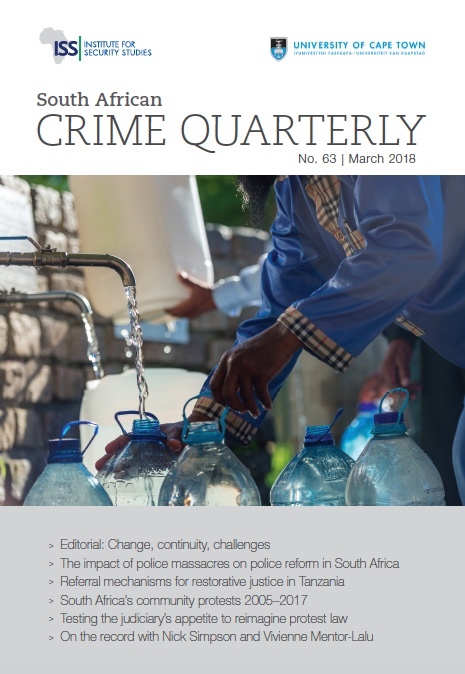 The articles in the March 2018 edition of SACQ illustrate or address change, justice, representation and response in criminal justice in South Africa and beyond. The articles by Guy Lamb and Ntemi Nimilwa Kilekamajenga ask how systems and agencies learn from periods of crisis. Lamb focuses on massacres perpetrated by the police in South Africa, and asks what impact these have had on changing the police organization. Kilekamajenga addresses the crisis of overburden and overcrowding in the Tanzanian criminal justice and prison systems, and asks whether this provides a moment to consider whether restorative interventions offer promise in resolving the problem. Peter Alexander, Carin Runciman, Trevor Ngwane, Boikanyo Moloto, Kgothatso Mokgele and Nicole van Staden draw our attention to the frequency and turmoil of community protests between 2005 and 2017, and challenge us to reconsider the ways in which protest is framed as violent, disruptive and disorderly, and how we measure and represent it in the media and elsewhere. Jameelah Omar provides a case note on the Social Justice Coalition’s constitutional challenge of provisions of the Regulation of Gatherings Act, which criminalizes the failure to provide notice of a gathering of 15 or more protesters. This case note discusses this significant judgment that declared these provisions of section 12(1)(a) of the Act unconstitutional. Two scholar/activists, Nick Simpson and Vivienne Mentor-Lalu, discuss the Water Crisis and its impact on questions of vulnerability, risk and security in “On the Record”, illustrating our society’s challenges increasingly touch questions about safety and security, and of how the nature of our responses (both in terms of who is able to respond effectively, and what that response looks like) visibilise questions about who benefits and who is left behind.